The (f)utility of debating creationists « Nothing in Biology Makes Sense! This is a guest post by Reid Brennan, a Ph.D. student studying the genomics of adaptation in response to environmental stress as part of Andrew Whitehead’s lab at the University of California, Davis. Ken Ham hates evolution. Bill Nye hates creationism. After Nye released the great video “Creationism is not appropriate for children“, Ham decided to personally respond in a number of videos (link, link). Eventually Ham challenged Nye to a debate, a challenge that Nye accepted. Now, I grew up in Kentucky, about 25 minutes from the Creation Museum and I visited the museum when it first opened (I somewhat regret giving them money, but that is another issue …). It is one of the nicest, most well done “museums” I have ever seen. There are full sized animatronics of humans and dinosaurs relaxing in the Garden of Eden (I believe it was a velociraptor, eating leaves, of course), interactive videos, “expert” testimonies, and on and on. I’m also an evolutionary biologist and can vouch for what an awful distortion of the natural world, the prehistoric world, the origin of species this “museum” truly is. While I think it is important to challenge creationists’ viewpoints, in terms of increasing awareness and understanding of evolution, this debate may end up doing more harm than good. First of all, only Ham wins. No matter how many rational arguments Nye makes, with just one misstep or one “I don’t know,” Ham gets his sound byte. In essence Nye is bound by facts while Ham isn’t. Science, as a process, doesn’t know all of the answers but is continually progressing to try to find them. However, because the creationism crowd lacks a fundamental understanding of science, these unknowns are “proof” that science has failed. Instead of citing evidence for why creationism is viable, Ham will try show why evolution isn’t. For example, Ham might cite some “discrepancy” in the fossil record or in radiometric dating or why no one has ever seen a speciation event, and ask Nye to explain it. Even if Nye knows the answer, the evidence for evolution is complicated and takes lots of time to explain; a debate is hardly the place where these explanations are easy or even possible. 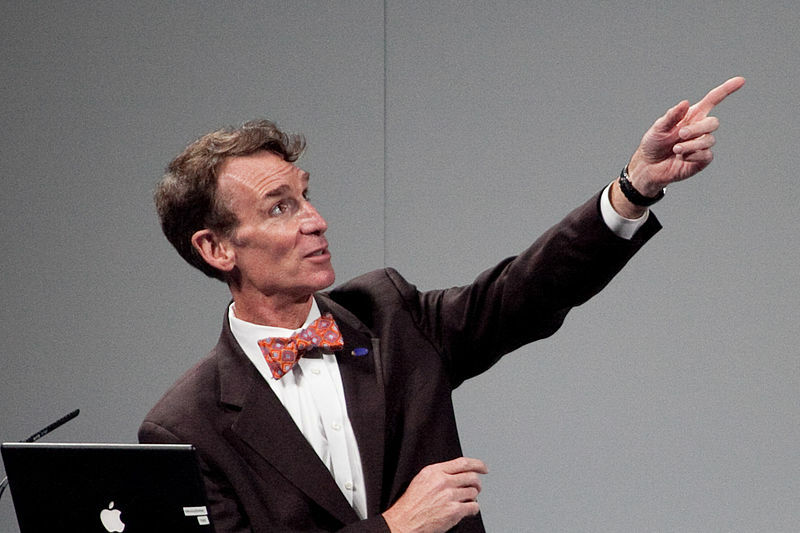 I also wonder if Bill Nye is the correct person to participate in this debate. Nye has a bachelor’s degree in mechanical engineering from Cornell and has recently been promoting science education and evolution in general, but he has not studied evolution extensively. Ham, on the other hand, is the head of one of the most prolific and successful creationist organizations in the world. Discrediting evolution is literally his only concern and he has spent years preparing for these types of debates. Sadly, the person with the most accurate facts does not win a debate; the person who is best at debating wins a debate. This debate also grants credibility to Answers in Genesis and likely makes them money (they’re already selling merchandise on their website). By simply engaging in the debate Nye is acknowledging that creationism can be considered as an alternative to evolution, which is untrue. Moreover, the debate is being held at the creation museum, tickets are being sold for $25, and videos are going for more than $10. Given the 900 seat auditorium, that’s a minimum of $22,500, not to mention the inevitable increase in donations. Why isn’t the debate being held at a neutral site and why aren’t the profits going to a mutually agreed upon cause? In spite of all of my pessimism, I do believe there are some reasonable arguments for why this debate is a good idea. First and foremost, there is the possibility that some creationists will actually listen to what Nye has to say. Nye’s arguments may be better received by the creationist crowd because he is not an academic and is therefore more relatable to the general public. For the majority of people watching, this debate will have no impact on their acceptance of creationism or evolution. But sowing the seeds of doubt in even a few creationists’ minds would be a positive thing. Nye also claims that one of his main purposes for doing the debate is to make Kentucky voters aware of the inanity of what is going on in their state and to convince them to stop giving tax breaks to the Creation Museum (Video Link). This, to me, is an admirable goal (and one with which I’m really on board, being a native Kentuckian). There’s also the chance that Nye wipes the floor with Ham. I’d bet that Nye knows what he got himself into and is going to be well prepared. I think he’s a smart guy and wouldn’t take up this debate if he didn’t think he could do a good job. Hopefully his confidence is not misplaced and logic will prevail. For those of you who are interested, the debate will be freely broadcast on YouTube February 4th and at debatelive.org. While I’m torn about the wisdom of the event, personally I won’t be able to pass up watching. What is your opinion of the debate? This entry was posted in creationism, science communication. I agree with you, Jeremy. Teach the Controversy (especially the really, really, dumb ones)!